My collection from one day of collecting while snorkeling the shallow shoreline. This small stretch of beach doesn't appear to have a name. It's just a small sandy area near Cheeseburger in Paradise. This small section of beach in downtown Lahaina on the island of Maui was completely empty of people. That is until I came back with my snorkel gear and came out of the water with several handfuls of glass. Then I started drawing a crowd. The glass is really hard to collect from shore as the waves are tossing and tumbling the small rocky ledge just under the water where the glass gets hung up. 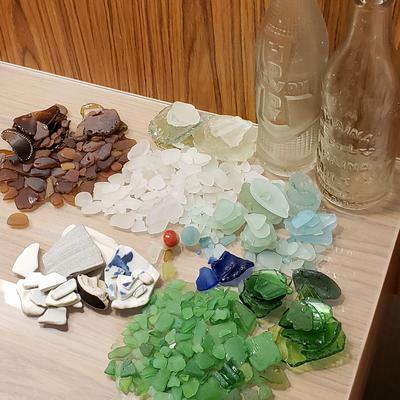 With snorkel gear, I collected all sorts of treasures, including some broken pottery, two marbles, two fully intact bottles and even a piece of glass that glows yellow under a UV light, indicating it's pre-1930s, so I've read. Most pieces are very small but they are "finished" pieces, meaning they are well tumbled and frosted. I mostly found clear, green and amber but did find a yellow piece, a few blues and teals. I saw some cool sea life too. One of those camouflage rock looking fish. Scared me at first, ha! This beach was the highlight of my trip to Maui. But don't bother if you aren't going to take your snorkel gear. It's just not impressive from shore, which is probably why there weren't many people there. When you are searching in your snorkel gear, be sure to bring a small bag to put your treasures in because there are so many, you'll fill your hands up too frequently that going into shore each time will become a real chore. I just used a small plastic bag that was about 2"x4" because it's what I had. I would suggest something a little bigger but with a small opening so they don't fall out. You won't have time to seal it between finds. You'll be constantly picking up pieces. Keep in mind, most are pretty small, but with the view from the water, you'll be getting the biggest pieces and have the best advantage. Stay shallow. No need to go deeper than arms length. Although, I did find the two intact bottles in about 2 ft. of water and I had to really dig them out. Comments for Cheeseburger in Paradise Beachfront?? Lucky! I just got back from Maui and the swell was high and the surf was rough! 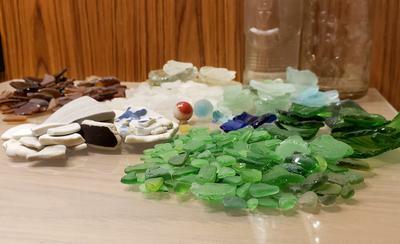 I also snorkel for sea glass. I wear a SpiBelt and it stretches enough to hold about two cups of treasures. When it’s full, I take a break and empty it. This trip I found my first ever marble (on Oahu) and then another on Maui! That is a really impressive report! Thanks for being so comprehensive. It's probably good that it will take a little work to get those nice pieces. No pain no gain. Not that it's a pain snorkeling in Hawaii.